Oil Skimmer finds extensive usage in waste water treatment plant to remove excess oil from sewage and industrial effluent water. The Oil Skimmer that we offer is manufactured in accordance with our proprietary multi-type skimming process. Our Oil Skimmer is high in demand in the market due to its smooth functioning and longer functional life. We have emerged as a trusted Manufacturer and Supplier of Oil Skimmer from Delhi, India. The belt of the Oil Grabber attracts the oil and hydrocarbon components from the liquid surface. The contaminants are then scrapped off the sides of the belt and easily discharged. 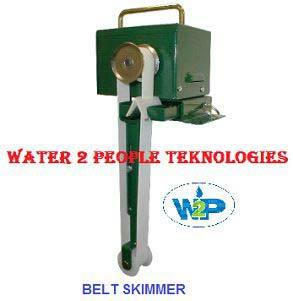 The skimmer removes oil up to 50 to 1000 liters/hr depending on the capacity of the skimmer and nature of the effluent. 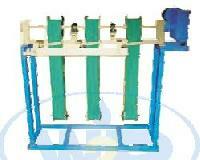 It provides optimal operation even in fluctuating depths. Helps maintain requirement of water discharge as per Govt. Greatly reduces oil disposal cost and makes reuse of recovered oil for general lubrication purposes / Boiler Fuel / companies reclaiming oil. 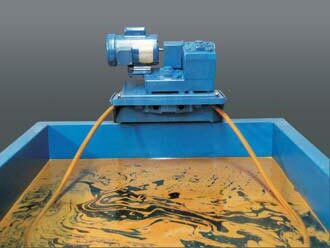 It lifts and separates oil from pit with any draft without the use of Pumps. Negligible maintenance, minimal power and easy to operate. Unit efficiently operates in hazardous as well as in turbulence / fluctuating flow of liquid / effuent in drain. Easy to install, use and maintain without any extra cost & spares. Continuous operation of unit without any labor. Outdoor Ponds, Lakes, Basins, Etc.